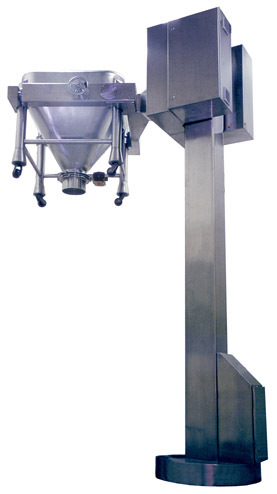 The IEDCO IBC Post Lift is designed to be mounted on a level floor and can be self-supporting or supported from a bearing support at the top. The Post Lift is electrically powered and designed to accurately lift and swivel, if required. The completely electric design makes the machine more reliable, trouble-free and smoother operating than either hydraulic or pneumatically powered units. There is no leakage, no motion creep, and far less maintenance. Material lifts, bin blenders, drum inverters, bulk container dumpers, and other custom lifting systems are also available.